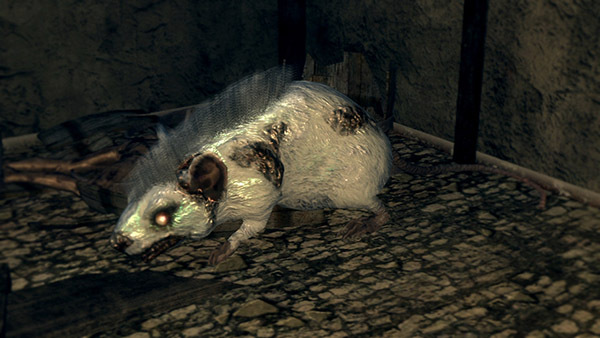 Their behavior is identical to the Small Undead Rat, but they are white, have slightly more HP, and inflict Toxic instead of Poison. Biting attack - Basic attack, swinging its head against the player. Toxic buildup on hit. The toxin's HP loss rate is 7 HP/seconds. Standing attack - Will get up on it's back-feet and kind of drop down with it's paws. Also builds up Toxic on hit. Headbutt - Used as a quick stagger if you're nearby. Leap - Used if player is within medium range, extended version of the headbutt. 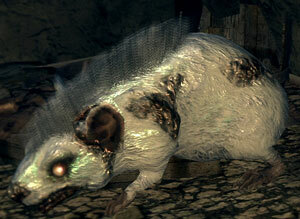 Don't get surrounded by these rats as even if you block its attacks, it still builds up toxin. Block safely using 100% toxin resistance shields. i.e. Spider Shield, Crystal Shield, and Greatshield of Artorias.